My quest to catch up continues as we now enter the week before the Academy Awards. Journey with me now to a distant past, one where we could still only speculate as to any given winner, a time when The Act of Killing seemed like a lock for Best Doc and “Alright, alright, alright” was only something that an impatient person might say. The week leading up to the Oscars was jam-packed with nominated films. The first one up? Woody Allen’s Blue Jasmine. Who among us really enjoys hanging out with fractured, damaged individuals? Not tolerates, mind you, or “does one’s duty” but actually spends time with a complete mess and has a great time? The answer, I’m relatively positive, would be that very few people, aside from masochists, actually derive any real pleasure from neurotic, morose, over-emotional basket-cases. Who among us, however, enjoys watching these individuals from the (relative) comfort and safety of our living rooms? That answer, at least judging by our collective viewing habits, would be quite different. Damaged people make terrible friends but they make really great fodder for entertainment, especially when springing from the fully loaded imagination of Mr. Neurotic himself, Woody Allen. As a filmmaker, Allen is almost a cottage industry, bringing audiences decade after decade of schlubs, nebbishes, jerks, wallflowers, social misfits and generally unpleasant people. That he’s managed to present these characters for nearly 50 years is impressive enough but Allen has (usually) managed the rather nifty hat-trick of making these fractured folks at least somewhat likable. At the very least, these are people that we recognize (whether or not we recognize them from the mirror, however, is a whole ‘nother kettle of fish), friends, neighbors and family that drive us to distraction but still, for some reason, deserve our love at the end of the day. Blue Jasmine, Woody Allen’s 44th feature film (yikes! ), introduces us to one of his most prickly, unpleasant creations: Jasmine (Cate Blanchett). In an Allen multiverse filled with neurotic characters, Jasmine may just reign as their queen. We first meet her overwhelming an old lady on a plane with her life-story, a bludgeoning than continues all the way onto the tarmac and into baggage claim. Jasmine never stops talking and the old lady never has a chance to do much of anything but smile politely and nod. Once they separate, the old woman’s husband asks her about Jasmine, only to be told that she seemed to be talking to herself. One encounter in, we get the message loud and clear: Jasmine is her own best friend and worst enemy. Jasmine goes to stay with her sister Ginger (Sally Hawkins), which is a decided change from the old days when Jasmine and her white-collar-criminal husband, Hal (Alec Baldwin), were on top of the New York social scene. Many defrauded investors and a prison-stay for Hal (where he hangs himself) later, Ginger and her new boyfriend, Chili (Bobby Canavale) must help to take care of the penniless, clueless Jasmine. Just as spoiled, privileged and nasty as she was back in the “good ol’ days” but with none of the money and fancy apartments to back it up, Jasmine must, somehow, integrate herself into a world that is not only frightening and mystifying but most certainly beneath her. As Jasmine sails from one unpleasant realization to another, she comes to see that the people you step on while you climb are the same people who end up stepping on you. Will she learn the lesson too late or is there still hope for this entitled twit? In a long career filled with buoyant highs (Annie Hall, Manhattan, Stardust Memories, Radio Days), Blue Jasmine easily stands as one of Woody Allen’s finest films. In fact, the film was probably my favorite Allen film since Radio Days and easily stands tall next to his established classics. As usual with Allen’s films, the various ingredients poured into this make all the difference in the final product. Start with a smart, sharp script that graces everyone in the cast with some truly juicy dialogue. Add in one of those stereotypically far-reaching, all-star Woody Allen ensembles (Blanchett, Baldwin, Hawkins, Andrew Dice Clay, Louis CK, Peter Sarsgaard, et al). Mix in some incredibly complex characterizations and voila! 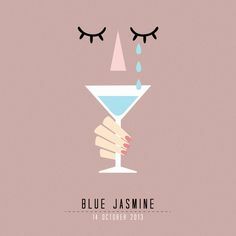 You have one Blue Jasmine. In a film filled with great performances, however, three actors really stand out: Blanchett, Hawkins and Clay. Blanchett ended up winning the Academy Award for Best Actress and the choice was a complete no-brainer: no matter how good any of the other nominees were, Blanchett was just that much better. Period. I’m not even a huge fan of hers, to be honest, and I found her entire performance to be utterly captivating and impossible to look away from. While Jasmine is not a likable character, she is a completely relateable one, a person that we’ve all known and (perhaps) been. It’s to Blanchett’s tremendous credit that she makes the finale such a complete punch in the gut: without her fearless, withering performance, the final twist (and it is a twist, folks, almost as nifty as the ones Shyamalan used to pull off) would have nearly the impact. As it was, the final shot had me completely devastated: she’d already won the statue by that point, as far as I’m concerned. Initially, I thought that Blanchett’s Jasmine would serve as this film’s Allen stand-in but she ends up being even more irreparably damaged than his protagonists usually are: this is the dark side of the neuroticism he normally traffics in. Sally Hawkins, although not as dynamic as Blanchett, does amazing things with the potentially thankless role of sister Ginger. There is real pain in Hawkins performance, along with a surprising amount of self-assurance and joy. For the most part, Ginger is marginalized by everyone around her and it would be the easiest thing in the world for her to shut down and play the victim, as Jasmine so readily does. Instead of that, however, Ginger continues to love and keep her heart open, despite the constant negative reinforcement she receives from guys like Chili and Al (Louis CK). Blue Jasmine was never Ginger’s movie but it’s a film that wouldn’t exist without her, at least not with the same kind of soul and passion. Although I didn’t feel that Hawkins performance was the best of the year, I was still overjoyed to see her at least acknowledged with a nomination. Any actor was going to stand in Blanchett’s shadow on this one but Hawkins managed to hold her own. In the complete surprise category, however, we have Andrew Dice Clay as Ginger’s prickly ex-husband, Augie. Full disclosure: I’ve never cared for Clay, particularly back during his foul-mouthed “golden years.” His performance in Blue Jasmine, however, was a complete revelation. Not only was Clay completely invested in the character (this was no Ford Fairlaine, for sure) but he managed to make Augie extremely likable. There was still some of Clay’s blue-collar jerkitude in evidence but Augie is no cardboard-cutout. Similar to the ways that John Travolta and Burt Reynolds had their careers resuscitated via Pulp Fiction and Boogie Nights, I sincerely hope that Clay’s turn in Blue Jasmine ushers in a new era for him. After this, he’s earned my respect enough to check out his next project…providing he doesn’t decide to grace us with Brainsmasher 2, that is. While I certainly wasn’t surprised that Blue Jasmine (and Allen) were under-represented at this year’s Oscars, I was definitely disappointed. Allen, much like Polanski, is a highly polarizing figure whose personal and professional lives often become a bit too intertwined, at least as far as the general populace goes. Love him or hate him, however, there’s absolutely no one who should deny what an astounding film Blue Jasmine is. If you’ve always been an Allen fan, rest assured that Blue Jasmine is one of his all-time bests. If you’re not an Allen fan, you still owe it to yourself to see the film, especially you’ve ever know anyone who’s struggled with depression or mental illness. Blue Jasmine is many things: funny, sad, infuriating, uplifting. The one thing it’s not, however, is easily ignored.